Home Tags Posts tagged with "muscle fibres"
Japanese researchers mapped the muscles fibres of cheetah known to accelerate to record-breaking speeds. By comparing the cheetah’s muscles with those of a domestic cat and dog, the team identified the special propulsion power of its hindlimb muscles. The study is the first to investigate muscle fibre distribution across the whole of the cheetah’s body. The findings are published in the journal Mammalian Biology and examine how the muscle fibres of domestic cats and dogs compare with those of the world’s fastest land mammal. “The study of muscles is indispensable to understand the cheetah’s run,” said Dr. Naomi Wada, the study’s co-author and Professor in System Physiology at Yamaguchi University in Japan. Different types of muscle fibre are suited to different activities, explained Dr. Naomi Wada. In all the animals studied, so-called Type I fibres produced a small force output but were resistant to fatigue, making them best suited to maintaining posture and slow walking. Type IIa fibre performance was best suited to fast walking and trotting whereas Type IIx or “fast” fibres created a high force output but had low endurance and were key to fast running or galloping. By mapping the distribution of fibres across the muscles of a cheetah’s body, scientists were able to gain insights into the animal’s impressive sprint technique. “The functional difference between forelimb and hindlimb is the most remarkable in the cheetah,” said Dr. Naomi Wada. The team’s results suggested that the power comes from the cheetah’s hind legs, in the same way as a rear wheel-drive car, according to Dr. Naomi Wada. She drew a further automative parallel when describing how the cheetah handles at high speed. The digits of the cheetah’s hindlimbs contained no fast fibres, but the digits on the front legs contained many of them. Dr. Naomi Wada explained that this is because the cheetah controls its balance by using its forefeet to turn and slow down. However, most rear-wheel drive cars cannot mimic the enviable acceleration of the cheetah: zero to 60 mph in under three seconds. Previous studies have indentified the cat’s seven metre stride-length as key to this ability. 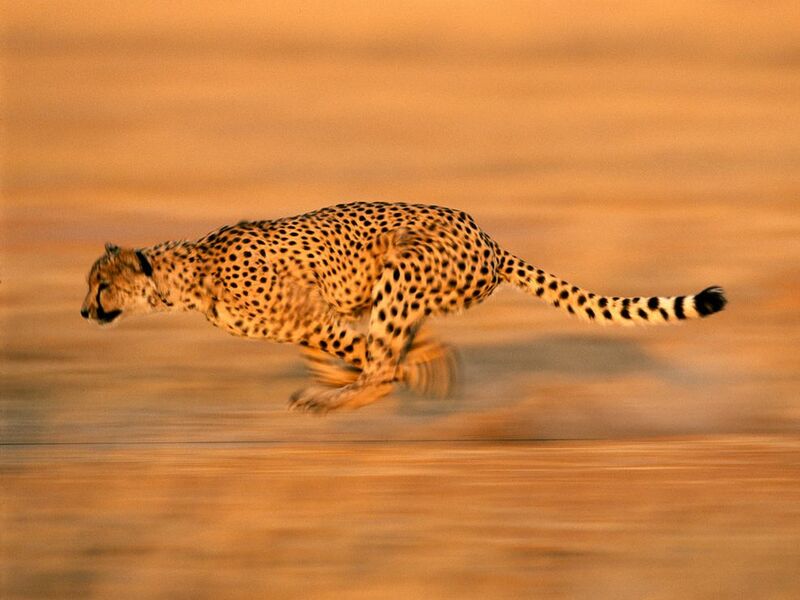 With long, flexible limbs, a sprinting cheetah spends more than half its time airborne. In order to maximize this effect, it arches and contracts its spine, and Dr. Naomi Wada and colleagues found muscle fibres that supported this technique. The cat had a high percentage of fast fibres running along its back and middle, suggesting that it could produce a quick, strong extension of the backbone.